Directed by the maniacal Regent, the enemy pressed forward with one goal - the destruction of mankind. The Superpowers of Earth, enemies for over a century, have banded together to face the threat from outside, and their combined forces have fought, delaying actions to buy time. But now the Rim has fallen, and the heart of human space lies before the invaders. On three worlds, mankind will make its stand, and all the power Earth and its colonies can muster has been gathered there. Three worlds - Sandoval, Garrison, and Samvar. The Line. Erik Cain grimly leads his Marines and their new allies to Sandoval, to fight and to hold that world against anything the enemy throws at it. But Cain plans more than just a defense; he intends to annihilate the enemy forces...and he'll sacrifice anything to win the ultimate victory. Even himself. 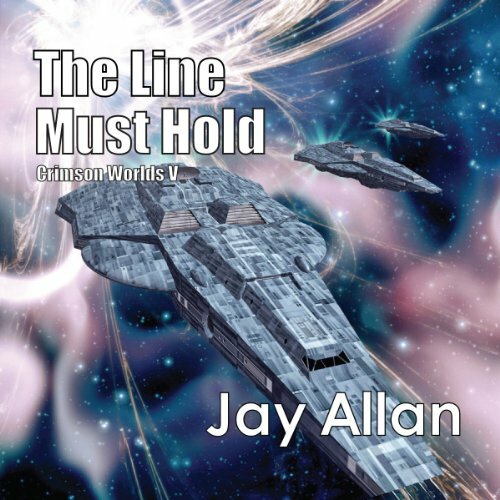 Would you consider the audio edition of The Line Must Hold to be better than the print version? No. Jeff Bower makes the audio version obnoxious. I only keep buying the series because it's good enough to offset Jeff. What didn’t you like about Jeff Bower’s performance? His voices, inability to pronounce normal words, random swapping of words that rhyme with the word Jay Allen actually wrote. Females all sound like three year olds, the asian voices are downright racist. Dear Jeff Bower,The rank of Ensign is pronounced En-Sin. It is not pronounced Enzen. Also, stop trying to do voices, you are only able to do offensive stereotypes. 1940s cartoons handled asian voices with less racism. The exploits of the marines and navy continue to stay fresh even after this many books. While each book is no longer a complete story I like the over arching theme and story of those portion of the story arc.